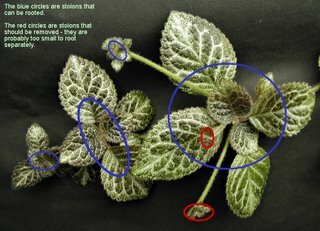 I found this explanatory photo the other day - something I took ages ago but I still follow the same process for propagating Episcia from stolons. I like to use stolons with 2 pairs of leaves rather than more - these small cuttings generally grow to be a nice shape with the first set of leaves close to the soil surface. 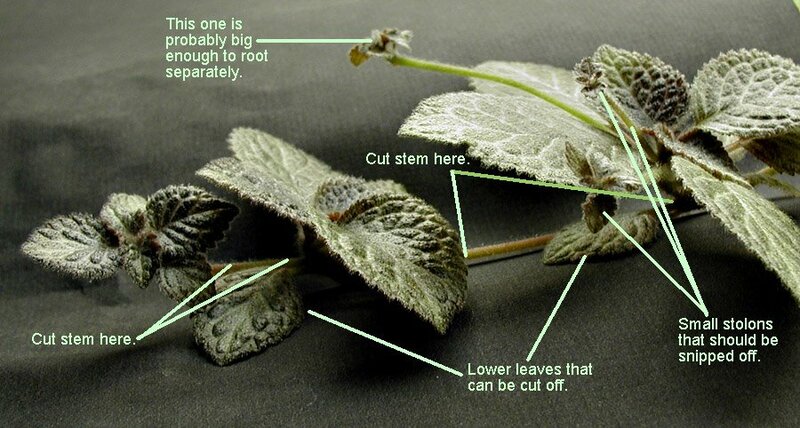 Any lower leaves are trimmed off: I keep about 1-2 inches of stem attached and discard the rest. Episcia stolons root easily in humid conditions - very easily. I remove any flowers, buds, and stolons from each cutting because I am impatient when it comes to these - even though they are quick rooters. Stolons can also be pinned down to the soil surface while still attached to the parent plant. Here is a side view of the same cutting.